31 Dec 2009 Hüsker Dü news page updated. 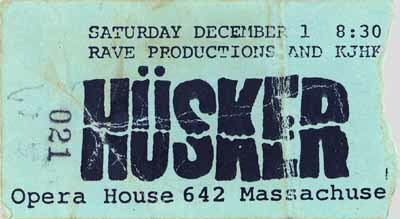 31 Dec 2009 Put up a print ad image for Hüsker Dü's 31 Dec 1980 gig at the 7th St Entry and updated the 1980 flyer index page. Thanks to Bryan Kuntz. 31 Dec 2009 Received information that the uncertain 12 Jul 1982 Club COD (Chicago) Hüsker date was in fact 12 Aug. Made the correction to the dates page. Thanks to Sumant Ranji. 30 Dec 2009 Added a new Nova Mob Last Days Of Pompeii-era publicity shot and updated the publicity photo index page. and updated the 2009 flyer index page. Thanks to Jeremy Frey for the Grog Shop photo. Also added one more of his photos to the Grog Shop performance stills page. 29 Dec 2009 Put up a poster image for Grant Hart's February New Zealand tour and updated the 2010 flyer index page. Thanks to Dom Coyle. 29 Dec 2009 Found a broken link in the discography entry for Bob Mould's 19 Jun 2007 appearance on The Henry Rollins Show. It once led to a page on the IFC site with links to two unaired segments with Bob. Found the segments elsewhere on the site and added individual links to them (a performance of "Again And Again" and a six-minute interview. Thanks to Dmitry Shakhanov for finding the new links. 26 Dec 2009 Embedded "Sinners And Their Repentances" video clip in the annotated discography entry for Bob Mould's 31 Dec 1989 appearance on Technical Difficulties, a program that aired on Minneapolis public TV station KTCA. 25 Dec 2009 Embedded "Little Drummer Boy" video clip in the annotated discography entry for Bob Mould's 19 Dec 1996 appearance on the Daily Show on Comedy Central. Grant's impromptu covers of "Teen Angel" and "Ruby Baby" at the Grog Shop necessitated updates to the Songs Covered page and the Song Titles page. Also used a couple of photos for a Cleveland gig stills page and another for a new addition to the Miscellaneous Candids page. Thanks to Andrew Barton (DC setlist) and Jeremy Frey (Cleveland setlist and photos). 25 Dec 2009 Put up a flyer image for Grant Hart's 21 Dec 2009 show at the Velvet Lounge in DC and updated the 2009 flyer index page. Thanks to Andrew Barton. 18 Dec 2009 Updated the venue info page for Lost Horizon (Syracuse) with recollections provided by correspondent Sue Hawkins. 18 Dec 2009 Hüsker Dü news page updated. Thanks to Adele Fiorani (photographer) and Antonio Baruzzi for the Ravenna photos, and to Sean Mundy (photographer) and Greg Lozoff of MeetYouAtTheShow.com for the Montréal photos. 17 Dec 2009 Updated the entry in the Hüsker Dü bibliography for the upcoming Andy Earles Hüsker bio, based on info from its recently added Amazon listing. We now have a title, Husker Du: The Story of the Noise-Pop Pioneers Who Launched Modern Rock, and a publication date, 15 Jul 2010. Thanks to Andy Nystrom for the pointer. 17 Dec 2009 Put up a venue image page for the site of the former New York Theatre in Vancouver and added its link to the dates page. Added dates page links for these as needed and updated the flyer index pages for 1989, 2008 and 2009. 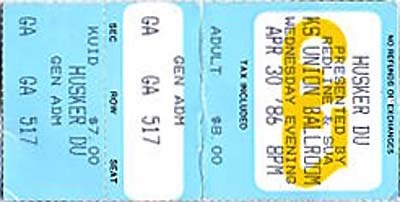 15 Dec 2009 Received confirmation from correspondent Keith Owen Richards that the May 1986 Hüsker Dü show in Vancouver did in fact take place at Luvafair, thus removing any lingering doubt that the venue might have been the New York Theatre. Updated the dates page to reflect the clarification. A check of the current status of the New York Theatre site led to the discovery that the building, apparently not in active use at present, has been proposed for preservation as a cultural landmark, and made appropriate updates to its its venue info page. 13 Dec 2009 Put up a setlist page for Friday night's (11 Dec) Bob Mould solo show at Bronson, Ravenna, Italy. Thanks to Antonio Baruzzi. 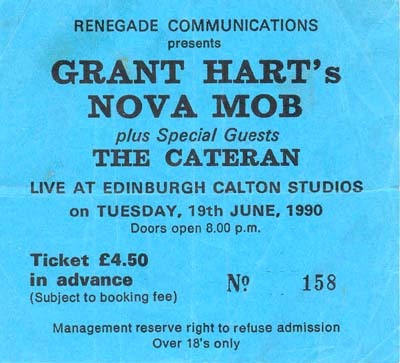 13 Dec 2009 Put up a print ad image for Grant Hart's February Australia tour and updated the 2010 flyer index page. Thanks to Rob Schieron. 12 Dec 2009 Added the 02 Mar 2010 Carnegie Hall tribute to the Who show, featuring Bob Mould, to the dates page, put up a poster image for it, and updated the 2010 flyer index page. 12 Dec 2009 Added Grant Hart's 18 Nov 2009 instore performance at Silver Platters in Seattle to the dates page. 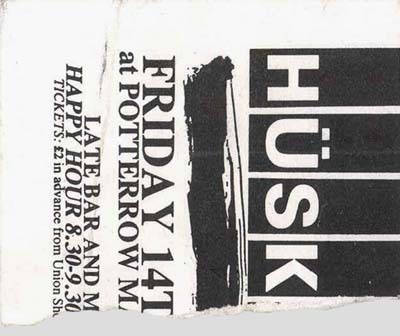 12 Dec 2009 Updated the Hüsker Dü news page for the first time in a while. The jury is still out on whether or not this is a viable project. 09 Dec 2009 Grant Hart's 16 Dec 2009 date at the Middle East in Cambridge MA has been rescheduled for 11 Jan 2010 (logistical/itinerary issues). Thanks to Jason Murphy for the heads up. 08 Dec 2009 Added a recently-scheduled Grant Hart date, 31 Dec 2009 at Station 4 in St Paul, to the dates page. Also put up a venue image page for Station 4, and while I was at it, a venue image page for The Tunnel in Milan (where Bob Mould will be playing shortly). 08 Dec 2009 Added an entry to the annotated discography for the Fucked Up single Do They Know It's Christmas?, with Bob Mould (among many other indie rock luminaries) on vocals, due to be released on iTunes today, and put up a preliminary artwork page for it. Also updated the summary discography. 08 Dec 2009 Put up a setlist page for last night's Bob Mould solo show at Bloomsbury Gardens, London. Thanks to Alan Millington. 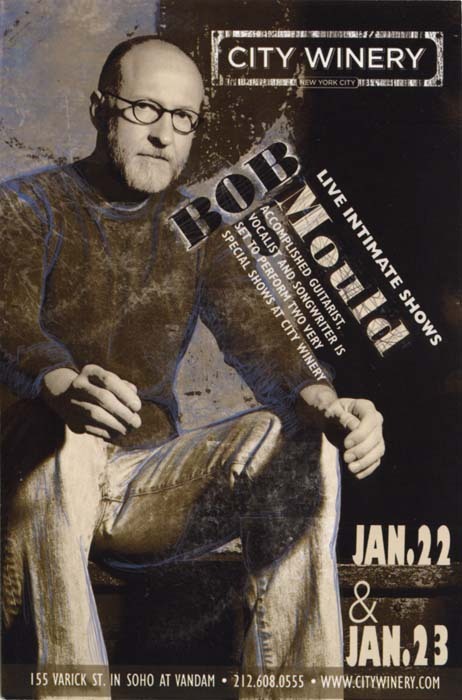 08 Dec 2009 Corrected the discography entry for the rumored live recording of the 20 Nov 1990 Bob Mould show at Montezuma Hall, UCSD, previously listed in error as a solo acoustic gig. Thanks to Paul S for the info. 05 Dec 2009 Put up a flyer image for the 25 Oct 1992 Sugar gig at City Gardens in Trenton and updated the 1992 flyer index page. 01 Dec 2009 Put up a flyer image page for the Hüsker Dü gig at Sam's in Dayton OH, 24 Mar 1982 and corrected the corresponding dates page entry (previously conjectured to have been sometime in April). That same flyer, furthermore, neatly discredits my 2004 "deduction" that this other flyer represented a 24 Mar 1981 show at the Minneapolis Sam's, an error also now fixed. Updated the skimpy Dayton Sam's venue info page and added a venue image page showing several lovely google streetview screencaps of the parking lot that now occupies the space. Thanks to Scott Nuckles for the flyer image and all the Sam's info. 28 Nov 2009 Put up a performance stills page for Grant Hart's 15 Nov 2009 show at the Hemlock Tavern in San Francisco. Thanks to Peter Whitfield for use of the photos. 27 Nov 2009 Put up a performance stills page for the Hüsker Dü 02 May 1985 show at the infamous Larry's Hideaway in Toronto. Thanks to Henry Martinuk for providing a pointer to this issue of the Ryerson University newspaper, The Eyeopener, which featured a Larry's retrospective piece accompanied by these photos. Also added the article (screen capture plus text transcription) to this site's magazine articles collection. Added the links to the dates page. 21 Nov 2009 Put up a page of still photos for Grant Hart's 17 Nov 2009 show at Dante's in Portland OR and added the link to the dates page. Thanks to Chris Metz and Michael Rooney (from Portland band Jack Ramsay, also on the bill) for the images. Updated the 2009 flyer index page and the dates page. Thanks to Chris Metz of Portland's Jack Ramsay (opening band) for the Dante's flyer images, and to John Mulhouse for the link that led to the Soo poster image. 21 Nov 2009 Put up venue image pages for Fillmore at Irving Plaza (NYC) and Al's Bar (Christchurch NZ), and added the links to the dates page. 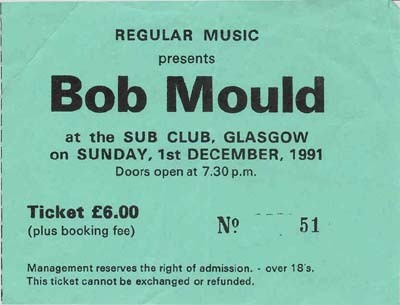 15 Nov 2009 Added a missing Bob Mould date to the dates page: 09 Sep 1991, Beach Club, Oslo, Norway. Thanks to Haakon Bratsberg. Updated the 2002 and 2009 flyer index pages, put up a 2010 flyer index page, and updated the dates page. 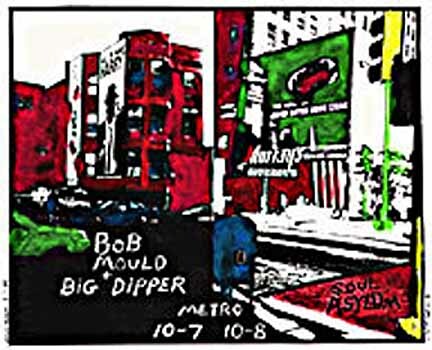 13 Nov 2009 Beefed up the artwork pages for Bob Mould's Live At ATP 2008 CD and Grant Hart's Hot Wax album. 13 Nov 2009 Repaired broken dates page venue link for Alvin's (Detroit). 12 Nov 2009 One more Bob Mould Italy date, also unconfirmed: 12 Dec 2009, Verona, Interzona. Thanks to Antonio Baruzzi. In addition, Grant's tentative instore at Amoeba in LA tomorrow night now looks like a no-go. Thanks to Cameron Metcalf for the pointer to the press release on Grant's Australia tour, and to Antonio Baruzzi for bringing my attention to Bob's Italy mini-tour. 20 Oct 2009 Put up a setlist page for last night's Bob Mould Band show at the Troubadour (LA), with Jon Auer (Posies) filling in on bass. Thanks to Nate Clesowich for his efforts in piecing this together. 19 Oct 2009 Added a newly-discovered upcoming Grant Hart date, 08 Nov 2009 at the Hi-Dive in Denver, to the dates page. 19 Oct 2009 Put up a setlist page for last night's Bob Mould Band show at Treasure Island Music Festival (San Francisco), which turned out to be a two-thirds Sugar reunion. Thanks to Sumant Ranji. 16 Oct 2009 Added Bob Mould's 14 Nov 2009 gig at Conservatorio diMilano (Milan, Italy) to the dates page. Thanks to Ole Krogstad for spotting this on Bob's Zeitgeist Management tour dates page. 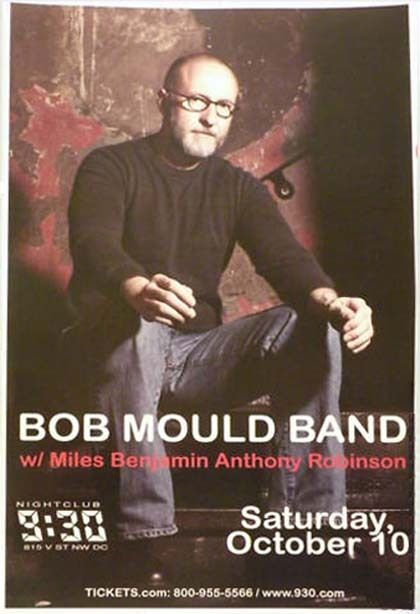 14 Oct 2009 Added Bob Mould's two recently-announced gigs at the City Winery (NYC), 22-23 Jan 2010, to the dates page. 14 Oct 2009 Put up a setlist page for last night's Bob Mould Band show at 1st Ave (Minneapolis). Thanks to Jason Narducy. 13 Oct 2009 Put up a setlist page for last night's Bob Mould Band show at Metro (Chicago). Thanks to Jason Narducy. Thanks to Jason Narducy for passing along the info. 11 Oct 2009 Belatedly added Grant Hart's 07 Oct 2009 gig at the Uptown Bar in Minneapolis to the dates page. 09 Oct 2009 Put up a setlist page for last night's Bob Mould Band show at Fillmore/Irving Plaza (NYC). 08 Oct 2009 Put up a setlist page for last night's Bob Mould Band show at the Paradise (Boston). 06 Oct 2009 Put up a setlist page for last night's Bob Mould Band show at Mod Club Theatre (Toronto). Thanks to Cameron Metcalf. 06 Oct 2009 Added some supplementary info provided by correspondent Nick Baker to the Barrel Organ (Birmingham UK) venue description page. Thanks to Rüdiger Höckel and Aaron Sumner for posting the info to the Sugar list. 01 Oct 2009 Added annotated discography entries for the Bug Music CDR sampler The Best Of Bob Mould and the limited-edition Klimek CD Dedications, which features a track titled "For Grant Hart & Bob Mould." Put up artwork pages for the sampler CDR and the Klimek CD, and updated the summary discography. 01 Oct 2009 Added Grant Hart's upcoming 24 Oct 2009 gig with the Mighty Mofos at the Turf Club in St Paul to the dates page. 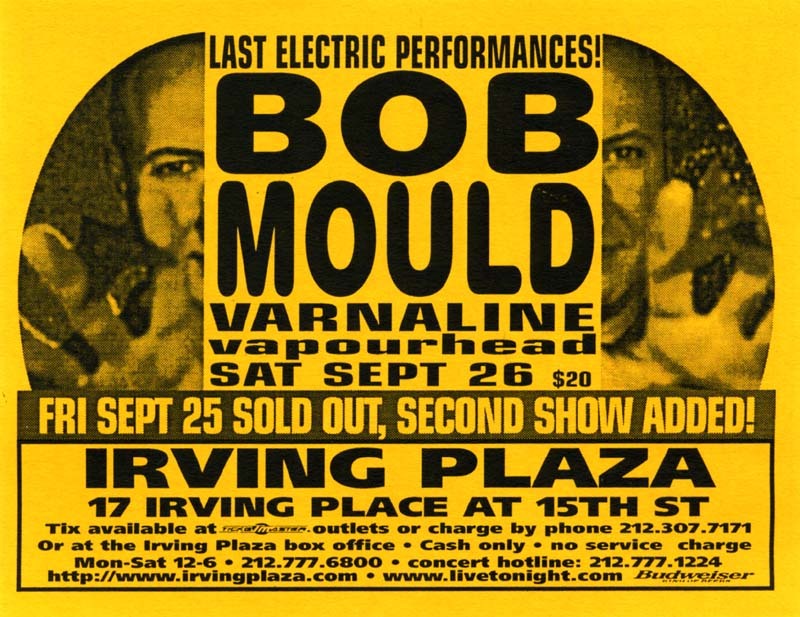 29 Sep 2009 Put up an annotated discography entry for Bob Mould's upcoming live CD, Live At ATP 2008, to be sold only at tour gigs; put up a preliminary artwork page for it, and updated the summary discography. Updated the dates page, put up venue image pages for Mears Park and Acadia Café; added flyers for the Party in the Park and West Bank Revival and updated the 2009 flyer index page. 23 Sep 2009 Learned that the 1986 NME giveaway 7" has been erroneously listed as untitled for all these years. Careful inspection of the label shows a title of NME's Big Four. Updated the summary discography as well as the above-linked entry in the annotated discography, and also took the opportunity to upgrade the artwork page. Thanks to John x1984x for spotting the title on his copy of the record and passing along the info. 23 Sep 2009 Added Bob Mould's 09 Dec 2009 show at Concorde 2 (Brighton UK) to the dates page and put up a venue image page. Also moved the flyer image for the Phoenix show to the 1983 flyer index page. Thanks to Bob Mould for pointing out the errors. 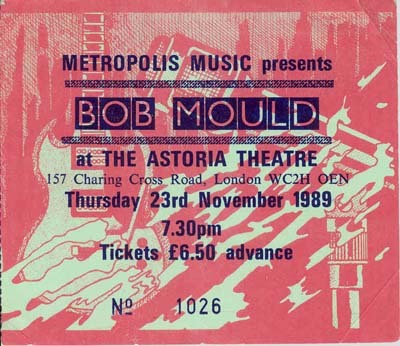 18 Sep 2009 Added Bob Mould's 07 Dec 2009 show at Bloomsbury Gardens, Victoria House (London UK) to the dates page and put up a venue image page. Thanks to Rob Schieron for posting the info to the Sugar list. 18 Sep 2009 Put up a page of still photos from the 13 Sep 2009 Bob Mould/No Age ATP gig (linked via dates page) and a page of after-show shots (linked via candids page). 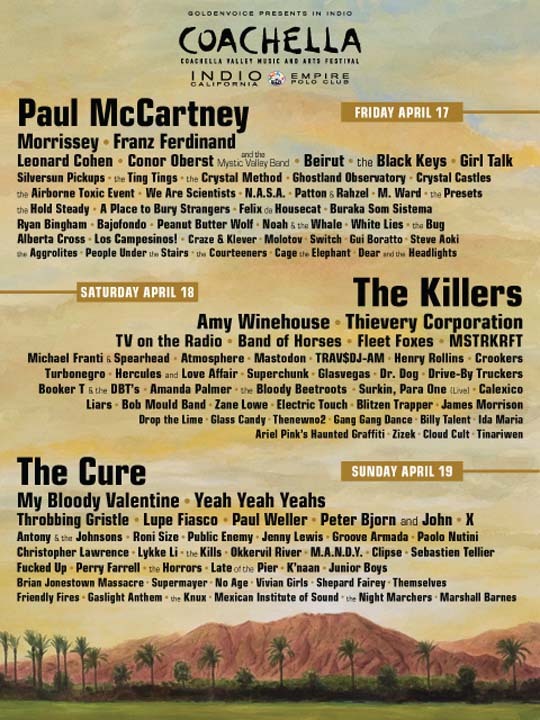 Also added an ATP set times poster image to the 2009 flyer index page. 14 Sep 2009 Put up a setlist page for Bob Mould's ATP show with No Age at Kutshers (Monticello NY) last night. 14 Sep 2009 Added Grant's 26 Sep 2009 gig at The Mousetrap (Eau Claire WI) to the dates page. 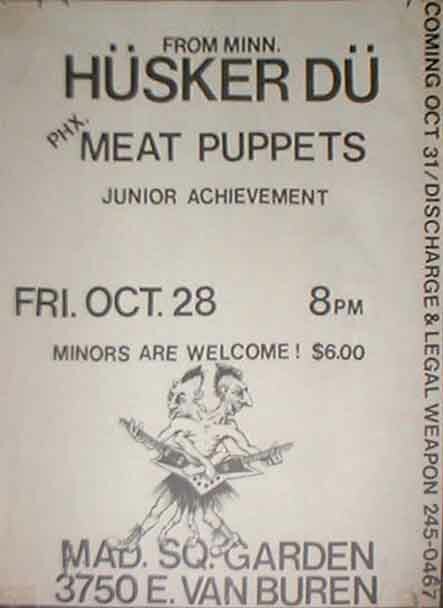 04 Sep 2009 Put up a Hüsker Dü news page to hold links to online news stories, features, reviews, etc. Still a work in progress. 04 Sep 2009 Added Grant's 15 Oct 2009 gig at the 7th St Entry (Minneapolis) to the dates page. 28 Aug 2009 Added Grant Hart's Facebook page to the Hüsker Dü links page. Thanks to Mary Grant for posting the info to the Sugar list. 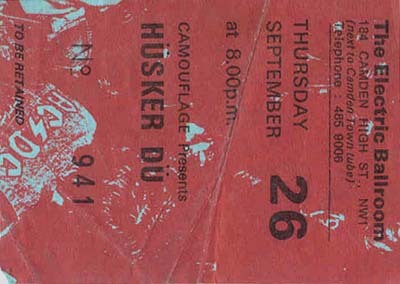 25 Aug 2009 Added a ticket image for the 13 Sep 1987 Hüsker Dü show at the River City Reunion festival (Lawrence KS) to the ticket collage page. 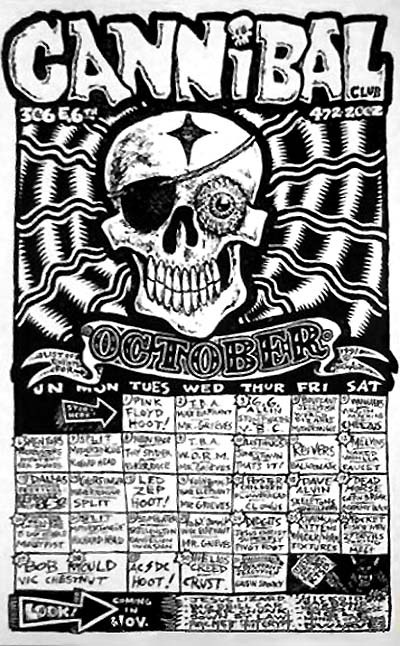 25 Aug 2009 Put up an image of the Cannibal Club (Austin TX) Oct 1991 calendar (27-28 Bob Mould gigs) and updated the 1991 flyer index page. 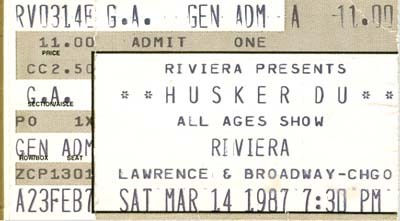 21 Aug 2009 Added a ticket image for the 14 Mar 1987 Hüsker Dü show at The Riviera in Chicago to the ticket collage page. Thanks to Edward Haack. 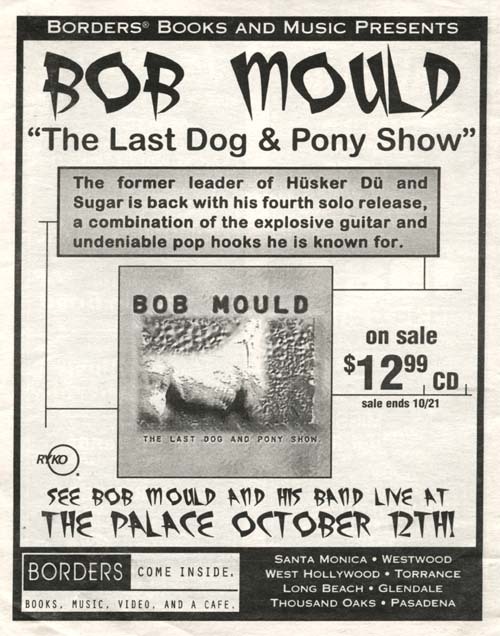 20 Aug 2009 Put up a setlist and flyer image for the 08 Oct 1989 Bob Mould Band appearance at the Indiana University Student Union. Updated the 1989 flyer index page and added the links to the dates page. 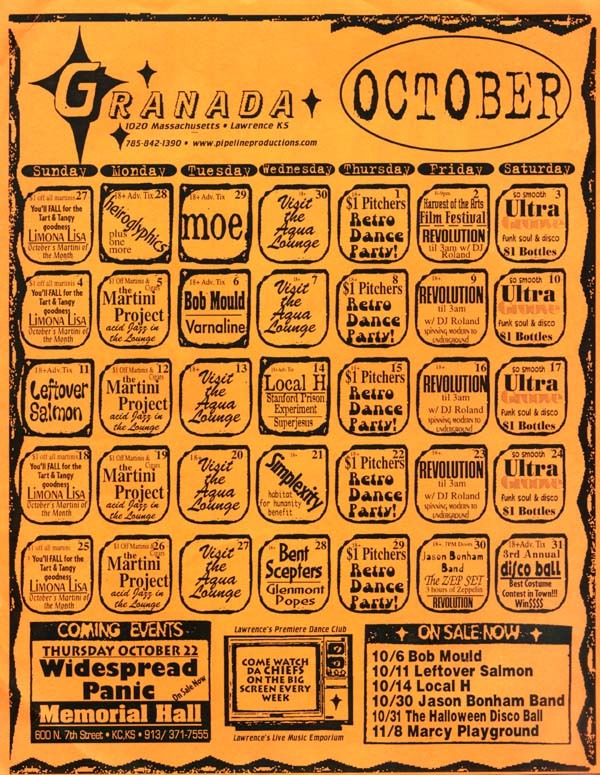 Thanks to Edward Haack for the images, and for pointing out that the apparently conflicting 08 Oct Cabaret Metro date shown on this poster actually refers to the Soul Asylum gig, thereby solving a minor mystery. 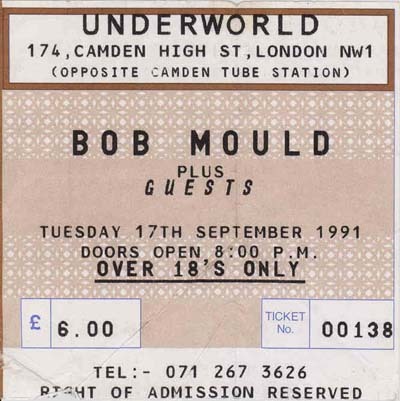 10 Aug 2009 Now that ATP's worst-kept secret has been officially revealed, it was time to add Bob Mould's 13 Sep 2009 appearance with No Age to the dates page. Also added an ATP flyer image to the 2009 flyer index page. 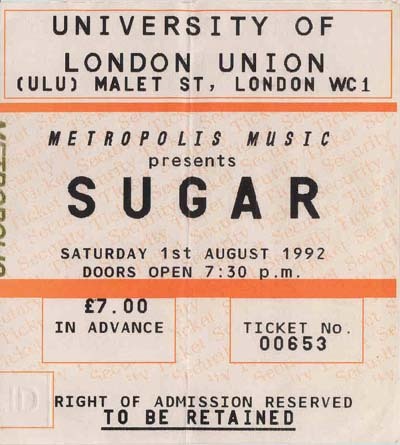 10 Aug 2009 Added a ticket image for the 12 Dec 1992 Sugar show at Docks in Hamburg to the ticket collage page. 10 Aug 2009 Gleaned some additional info about last month's Meat Puppets show in Duluth with Grant and Greg (Pizza Lucé, 15 Jul) from this online video, including a (partial?) setlist and a page of video screen captures. Updated the list of cover songs, since two of the songs were covers (Beatles' "Tomorrow Never Knows" and Bob Marley's "Three Little Birds). 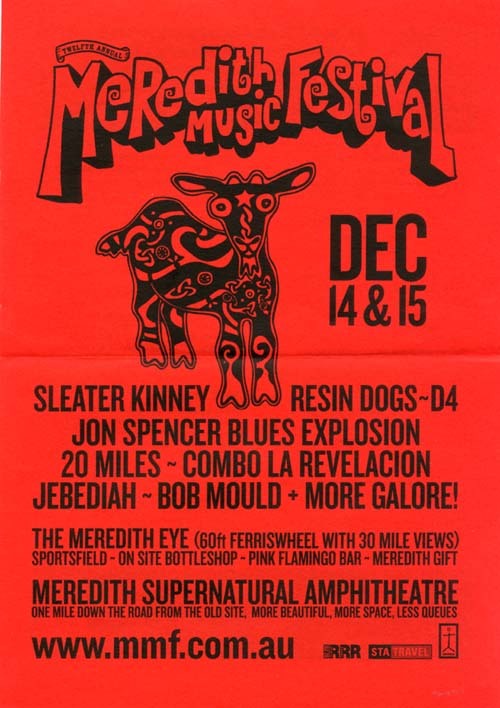 Also found an image (of sorts) of a poster for the show, and added that to the 2009 flyer index page. Put the links to all this stuff on the dates page. 08 Aug 2009 Added Australian band Bored's early 90s cover of "Pink Turns To Blue" to the Hüsker covers cross-reference page, added an entry for the parent VA EP, Post Tour CD, to the annotated discography, and put up an artwork page. 04 Aug 2009 Grant Hart and Greg Norton both turned up onstage at the 15 Jul 2009 Meat Puppets gig at Pizza Lucé in Duluth, according to this tidbit from Chris Riemenschneider in the Minneapolis Star-Tribune. Put up a venue image page for Pizza Lucé and updated the dates page. 02 Aug 2009 Added an entry to the Promo Audio section of the annotated discography for the VA Sight Needs Sound sampler CD from 2008, a mix of Epitaph and Anti- artists that includes Bob Mould's "Stupid Now" (from District Line). Put up an artwork page for it and updated the summary discography. Updated the 1985, 1986, 1989, 1990 and 1994 flyer index pages, and added the new dates to the dates page. Thanks to John Mulhouse. 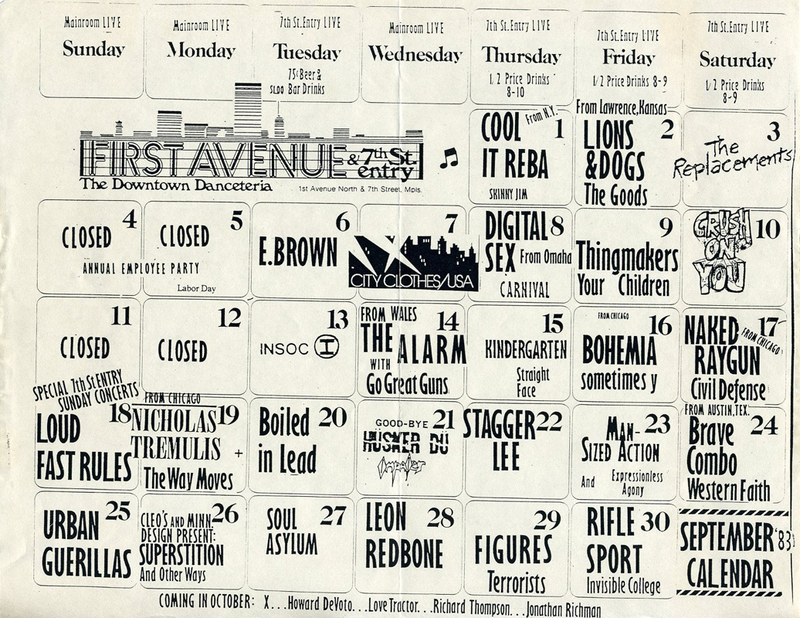 27 Jul 2009 Put up an image of the 1st Ave Sep 1983 calendar (21 Sep Hüsker gig) and updated the 1983 flyer index page. 27 Jul 2009 Updated the venue description page for Amelia's in Iowa City with info provided by correspondent David Murray. 26 Jul 2009 Put up an annotated discography entry for Grant Hart's upcoming new album, Hot Wax, about which details are beginning to emerge (street date 06 Oct), put up a preliminary artwork page for it, and updated the summary discography. Also added the previously unlisted songs to the Hüsker song titles page. Updated the 1984 and 1985 flyer index pages. Thanks to John Mulhouse. 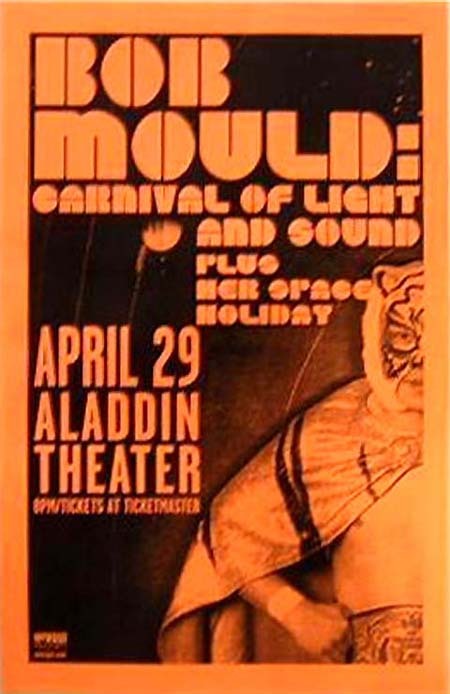 19 Jul 2009 Put up a flyer image for Bob Mould's 07 May 1991 show at Melody Ballroom (Portland OR), and updated the 1991 flyer index page and the dates page. 17 Jul 2009 Added this Hüsker caricature by Ashley Holt to the Hüsker Dü art images page. 17 Jul 2009 Added an entry to the Promo Audio section of the annotated discography for the VA Anti- Sampler CD from 2009, which includes Bob Mould's "I'm Sorry Baby..." as one of the tracks, put up an artwork page for it and updated the summary discography. Updated the 1983, 1984 and 1985 flyer index pages. Also updated the Oshkosh Labor Hall venue description page, put up a venue image page for it, and added the flyer link to the dates page. Thanks to Dave Mackenzie. 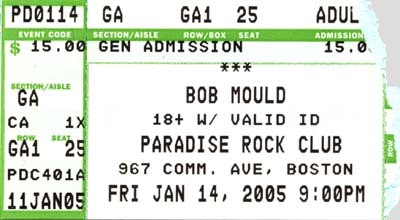 17 Jul 2009 Another Bob Mould Band fall show announced: 18 Oct 2009, Treasure Island Music Festival, San Francisco. Updated the dates page, put up venue image and flyer image pages for the gig, and updated the 2009 flyer index page. 02 Jul 2009 Belatedly added the Bob Mould Band 09 Oct 2009 show at Theatre of the Living Arts (Philadelphia), confrmed last week, to the dates page. Updated the dates page. and put up venue image pages for Vaudeville Mews and Butlin's. 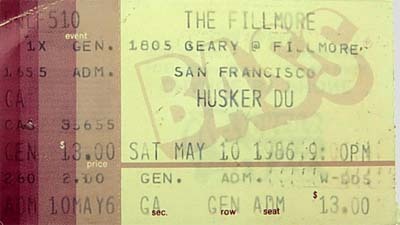 24 Jun 2009 Added a ticket image for the 10 May 1986 Hüsker show at the Fillmore in SF to the ticket collage page. Thanks to Kevin Whitehead for the Birmingham ticket image. 04 Jun 2009 Put up a setlist page for Grant Hart's show at Cafe Nine in New Haven CT last night and linked it to the dates page. Thanks to Joe Zibell and Chris Linehan. 03 Jun 2009 Put up a setlist page for Grant Hart's show at Valentine's in Albany NY last Thursday (28 May) and linked it to the dates page. Thanks to MikeL. 29 May 2009 Added some recollections by onetime Nova Mob guitarist Chris Hesler about Lost Horizon in Syracuse  now evidently back in business!  to the club's venue description page. 29 May 2009 Put up a setlist page Grant Hart's show at the Bug Jar in Rochester earlier this week (26 May) and linked it to the dates page. Thanks to Travis Vande Berg. 29 May 2009 Belatedly added "Little Johnny Jewel" (performed two weekends ago by Watt/Hart/Norton) to the Hüsker song titles page and the cover songs page. 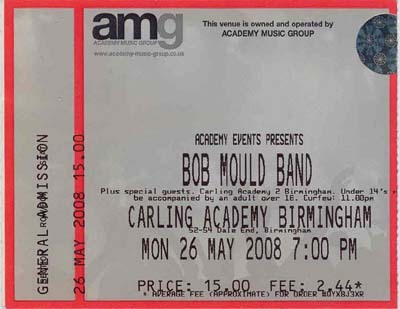 Bob Mould, 06 May 2009, O2 Academy, London Updated the flyer index pages for 1987, 1993 and 2009, and the dates page. Thanks to Kevin Whitehead. Thanks to Kevin Whitehead for all the image scans. 20 May 2009 Learned that Grant Hart played a fourth date during his recent Austin trip, a non-SXSW gig 17 Mar at the Hole In The Wall. Put up a performance stills page, a setlist page and a venue image page for the Hole In The Wall, and added all this stuff to the dates page. Thanks to Steffen Paulus for the setlist and gig photos. 17 May 2009 Greg Norton tagged along with Mike Watt and his band (The Missingmen) to Omaha last night for the gig at The Waiting Room, where Greg again guested with Watt, but also played a brief solo set. Put up a still shot of Greg onstage, a venue image page for the Waiting Room, and an image of Watt's flyer. Updated the dates page and the 2009 flyer index page. Thanks to Grant Hart and James Lindbloom for the info. 16 May 2009 Grant Hart opened for Mike Watt last night at the 7th St Entry in Minneapolis. For Watt's last encore ("Little Johnny Jewel"), Grant returned to play drums... and Greg Norton turned up to play bass. Updated the dates page and put up a setlist page. Thanks to James Lindbloom and John Mulhouse for the info and setlist. 16 May 2009 Fixed broken dates page link to the Tanzbrunnen (Köln) website and put up a venue image page. 03 May 2009 Put up a performance stills page and a setlist page for Bob Mould's solo gig last night at Luxor (Köln) and added the links to the dates page. Also added an image of the ticket to the tickets collage page Thanks to Rainer Driemeyer for the photos, scans, and setlist info. 30 Apr 2009 Added an entry for the promo version of Bob Mould's Life And Times CD to the annotated discography and the summary discography and put up an artwork page for it. 30 Apr 2009 Added an entry for Don't Go Back Quietly, Go With Aiwa (VA compilation CD featuring Nova Mob) to the annotated discography and the summary discography and put up an artwork page for it. Also updated the entry for Minnesota Modern Rock: The Pachyderm Sessions, since the two albums proved to be identical except for packaging, and beefed up its artwork page as well. 29 Apr 2009 A second NY Grant Hart date now listed on his website, 30 May at the Bell House in Brooklyn. Updated the dates page and put up a Bell House venue image page. Also noticed that the venue image link for Southpaw in Brooklyn was broken, and cobbled together a venue image page for that as well. 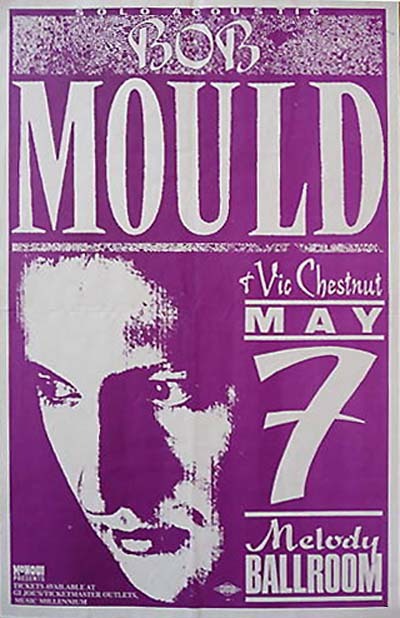 28 Apr 2009 Made a few fixes to the dates page based on discussions with Bob Mould: First, we've concluded that the putative 13 May 1985 show at Rockitz in Richmond could not have taken place as scheduled. 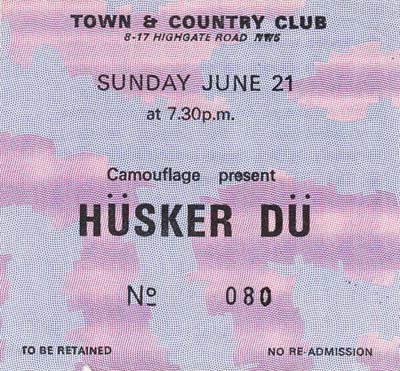 Appealing as it is to believe that Hüsker Dü could have pulled off gigs in Richmond VA, London UK, and Cleveland OH on three successive nights, the Richmond-to-London logistics are not realistically achievable. It's amazing enough that the Cleveland show went off on schedule. The 25 Jun 1985 Rockitz show was presumably the makeup for the Richmond cancellation. 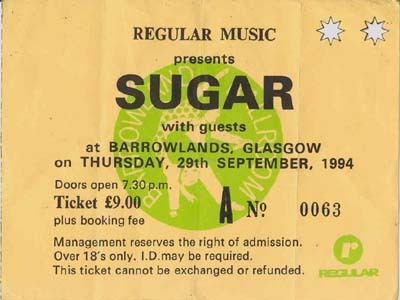 Second, Bob also notes that there was a Jan 1993 Sugar tour of Japan that was not documented here, with dates at Tokyo Quattro and Osaka Quattro, plus a third date at a different Tokyo club the name of which he does not recall. 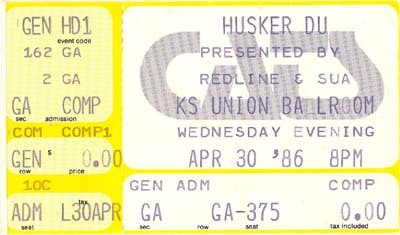 19 Apr 2009 Previously unlisted Bob Mould Workbook tour date determined from a flyer description listed on eBay: 10 Nov 1989 at the Bottleneck in Lawrence KS. Updated the dates page and the 1989 flyer index page. 19 Apr 2009 Put up a performance stills page (from screen captures) and a setlist page for the Bob Mould Band gig at Coachella yesterday, and added the links to the dates page. Thanks to Jason Narducy for the setlist help. 14 Apr 2009 Beefed up both the annotated discography entry for Life And Times and its accompanying artwork page. 11 Apr 2009 New Grant Hart date gleaned from a flyer posted to his MySpace page: 06 Jun 2009 at Howlers in Pittsburgh. Created a Howlers venue image page and a flyer image page for the gig and added the new info to the dates page. 11 Apr 2009 Put up performance stills page for Bob Mould's 08 Apr 2009 gig at Joe's Pub (NYC) and updated the dates page. Thanks to Jacob Blickenstaff for use of the photos. 10 Apr 2009 Added Italian band Sportclub's cover of "Never Talking To You Again" to the Hüsker covers cross-reference page, added an entry for the parent CD, Catchy, to the annotated discography, and put up an artwork page. 10 Apr 2009 Put up setlist pages for the two Bob Mould shows at Joe's Pub in NYC, 08 Apr 2009 and 09 Apr 2009 and added the links to the dates page. Thanks to Joe Zibell. 08 Apr 2009 Put up a setlist page for Bob's show last night at the Birchmere in Alexandria VA (accompanied by Jason Narducy, Amy Domingues and Rich Morel) and added the link to the dates page. Thanks to Brett Groves and Jeff Yutzler. 02 Apr 2009 Added this Bob Mould drawing, taken from a recent feature on Daytrotter, to the Hüsker Dü art images page. Thanks to Sean Moeller for permission to use the image. 02 Apr 2009 Venue change for Bob Mould's 01 May 2009 appearance in Köln: Bob now schedued to perform at Gebäude 9. Updated the dates page and put up a venue image page for the club. Thanks to Rüdiger Höckel for the pointing out the change. 02 Apr 2009 Put up performance stills pages for Grant Hart's 12 Mar 2009 gig at the Entry and Bob Mould's 30 Mar 2009 gig at the Varsity Theater, both in Minneapolis, and updated the dates page. Thanks to Stacy Schwartz for use of the Varsity Theater photos. 30 Mar 2009 Put up a setlist page for Bob's show last night at the Old Town School of Folk Music in Chicago (accompanied by Jason Narducy) and added the link to the dates page. Thanks to Jim Fagan. 28 Mar 2009 Added documentation to the live audio section of the annotated discography for newly-received Hüsker Dü recordings (purportedly) of the 31 Dec 1984 gig at Maxwell's (Hoboken NJ) and the 04 or 05 Jun 1982 gig ar the Calgarian Hotel (Calgary AB). Also put up setlist pages for the Maxwell's and Calgarian shows and added their links to the dates page. Thanks to Lasse W.
28 Mar 2009 Put up a performance stills page for Grant Hart's 27 Feb 2002 gig at Duffy's Tavern in Lincoln NE and updated the dates page. Updated the 2009 flyer index page and the dates page. 27 Mar 2009 Minor dates page improvements: better link for Eighth Street Taproom (Lawrence KS), and links to club images pages for Eighth Street Taproom and Eagle Tavern (SF). 20 Mar 2009 Put up a performance stills page for Grant Hart's 18 Mar 2009 afternoon gig at Creekside Lounge in Austin and added the link to the dates page. Added all this stuff to the dates page. Both appear legit, the first from early 1984, the second later the same year or early the next year. Thanks to Roy Isaksen and Sam Earman, respectively, for photos and info. 15 Mar 2009 Added an entry for the Rykodisc/Hannibal/Gramavision Spring Loaded promo compilation CD to the annotated discography, put up an artwork page for it, and updated the summary discography. CD includes an unlisted bonus track, "Egøverride," by Bob Mould. Coincidentally noticed for the first time that the version of "Egø" on the CD single is a significantly shorter edit than the album version, and added a note to that effect. 14 Mar 2009 Bob Mould's facebook page is back. Restored the link on the Hüskerlinks page. 14 Mar 2009 Added an entry to the bibliography for Homocore: The Loud and Raucous Rise of Queer Rock, by Ciminelli & Knox (2005), that features a chapter on Bob Mould. 13 Mar 2009 Added German band Sport's cover of "Never Talking To You Again" to the Hüsker Dü Covers & Tributes page and updated the Hüsker covers cross-reference page. Song released in mp3 format only and made available for free download. Thanks to Willi Raeckers for posting the info to the Sugar list. 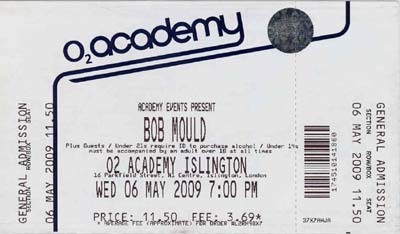 13 Mar 2009 New Bob Mould London date just announced, at O2 (formerly Carling) Academy, Islington Created and linked to venue image pages for Academy Islington and also the old Wardour Street location of the Marquee Club (one of whose later incarnations occupied the same space as the current Academy). Updated the dates page with the various new links. 13 Mar 2009 Added a note to the Life And Times entry in the annotated discography that the vinyl edition of the album is expected to be released in May. Updated the summary discography where required. 12 Mar 2009 Put up a setlist page and a performance photo page for Bob's appearance last night at the REM Tribute Show at Carnegie Hall and added the links to dates page. Also updated the songs covered page. 05 Mar 2009 Added the upcoming vinyl reissue of Candy Apple Grey by Rhino Records on 180-gram vinyl to the annotated discography and the summary discography. Thanks to Jay Montgomery for the pointer. 05 Mar 2009 Put up a setlist page for Bob's 02 Mar 2009 show at the Hotel Cafe in LA and added the link to the dates page. Thanks to Tom Beck. 04 Mar 2009 Added Amazon as a vendor of Bob Mould's digital single, I'm Sorry, Baby, But You Can't Stand In My Light Any More, released yesterday. Also put up an artwork page for it. 03 Mar 2009 Added setlist for Bob's Sunday night guest appearance with No Age at Bottom of the Hill and put the link on the dates page. Also added No Age's song "Miner" to the list of songs covered by Hüsker Dü or its members. 02 Mar 2009 Added Bob's guest appearance with No Age at the Bottom of the Hill in SF (Noise Pop gig) to the dates page and put up a performance stills page for the show. Thanks to Sumant Ranji for posting the info to the Sugar list and to hippiesaredead.com for the gig photos. Also made some updates to the Folk City venue description page and updated the links on the dates page. 02 Mar 2009 Added an undated (1985?) photo of Bob Mould to the Hüsker candids page. Photo, credited to Murray Bowles, appears in Glinert & Perry's Rock & Roll Traveler USA. 01 Mar 2009 Added an entry for the Anti- District Line Sampler promo CD to the annotated discography, put up an artwork page for it, and updated the summary discography. 01 Mar 2009 Added setlist for Bob's show last night in SF to the dates page. Thanks to Alex Bender. 21 Feb 2009 Added Bob's 03 Apr 2009 performance at the North Star Bar in Philly (mentioned in his latest email newsletter) to the dates page and corrected the date of the SF Noise Pop gig at Swedish American Hall to 28 Feb.
19 Feb 2009 Put up a performance stills page for Bob's 07 Apr 2002 COLAS show at PromoWest Pavilion in Columbus OH along with a venue image page for what has since been renamed the LC Pavilion. Put the new links on the dates page. Thanks to Stefan Kullik for sending along the photos (Photographer unknown). 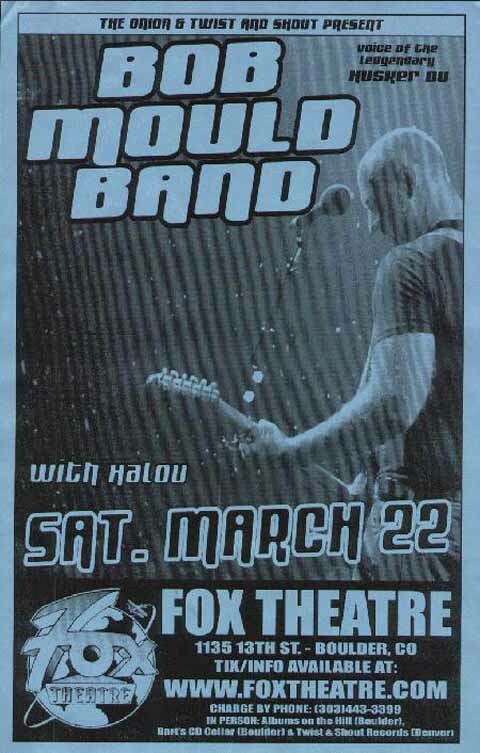 16 Feb 2009 Put up a flyer image for Bob Mould's 22 Mar 2008 show at Fox Theater (Boulder CO), and updated the 2008 flyer index page and the dates page. 16 Feb 2009 Anti- recently announced that "I'm Sorry, Baby, But You Can't Stand In My Light Any More" will be released in digital format via iTunes on 03 Mar 2009 as the first single from the Bob Mould's forthcoming album Life And Times. Updated the annotated discography and annotated discography and the summary discography. 14 Feb 2009 Updated the venue description page for the Gluepot (Auckland NZ) and put up a venue image page for it with a link from the dates page. 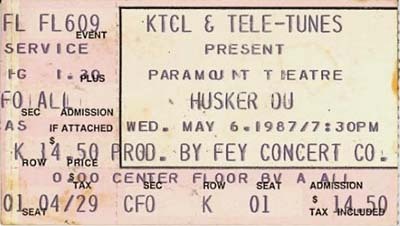 13 Feb 2009 Put up a Hüsker Dü interview and a review of their 14 Apr 1983 gig at the Jockey Club (Newport KY) from Blow It Off #2 and added the interview link to the magazine articles page. Also assembled a gig stills page for the show from photos published in the zine. Thanks to editor/publisher/reviewer/interviewer/photographer Scott Colburn for permission to use the materials. 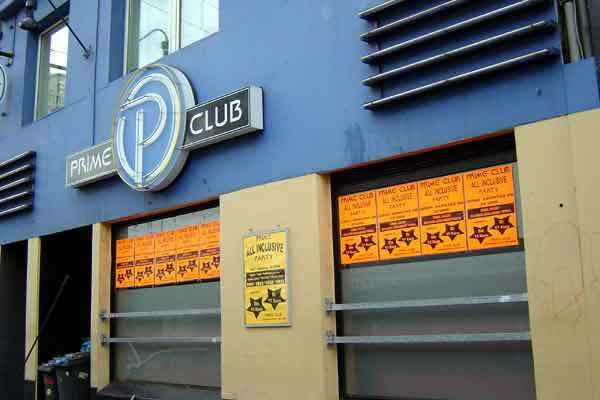 13 Feb 2009 Venue for Grant Hart's 18 Mar 2009 SXSW gigs has been annouunced as Aces Lounge. Updated the dates page and put up a venue image page for the club. Thanks to Travis Vande Berg for posting the info to the Sugar list. 13 Feb 2009 Updated the "Sorry Somehow" bridge page in the Hüsker Dü historic sites section after learning that it is about to be demolished. Thanks to Chris Hesler for the tip and article link. 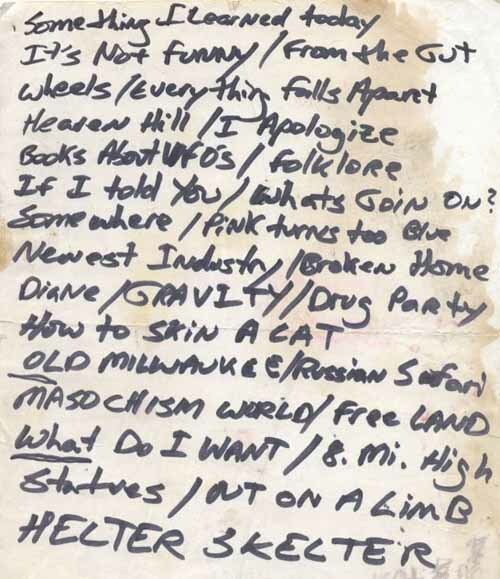 09 Feb 2009 Mike Blur has gone through his archives and bears the sad news that the Hüsker 13 May 1984 Foolkiller show did not in fact feature all the songs listed on this remarkable setlist. He also supplied the titles missing from the end of the 12 May 1984 gig at the Opera House in Lawrence. Updated both setlists. 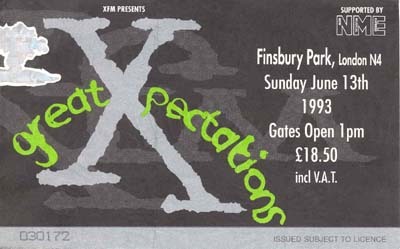 Updated the 1998, 1999 and 2002 flyer index pages and added new links to the dates page where needed. 07 Feb 2009 Put up a setlist page for the 13 May 1984 Hüsker gig at Foolkiller (Kansas City). 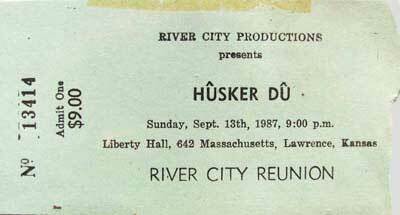 Updated the dates page and added "Russian Safari" to the Hüsker Dü song titles page. The setlist, which seems (and may be) too good to be true, was reconstructed from this interesting artifact, found on Mike Blur's Lawrence wiki site. 07 Feb 2009 Put up a short but charmingly ingenuous review of the 12 May 1984 Hüsker gig at the Lawrence Opera house, taken from issue #5 of local Lawrence zine National Priorities, as found on the Oxide Flake site. Added the review link to the magazine articles page. 07 Feb 2009 Upgraded the venue description page for the Lawrence Opera House, with a generous assist from Mike Blur. Check out his Lawrence Kansas alternative music scene history wiki if you have even a passing interest in exploring the history of local punk scenes. 06 Feb 2009 Fixed broken venue link on the dates page for the Bottleneck (Lawrence KS) and put up a venue image page for the club. 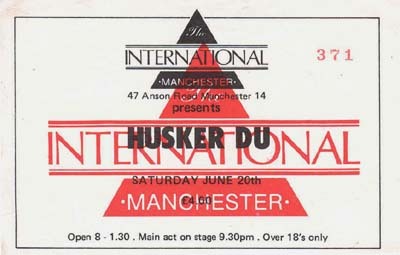 Updated the 1984 and 1986 flyer index pages and added the various new links to the dates page. Thanks to Sumant Ranji for the initial heads up. 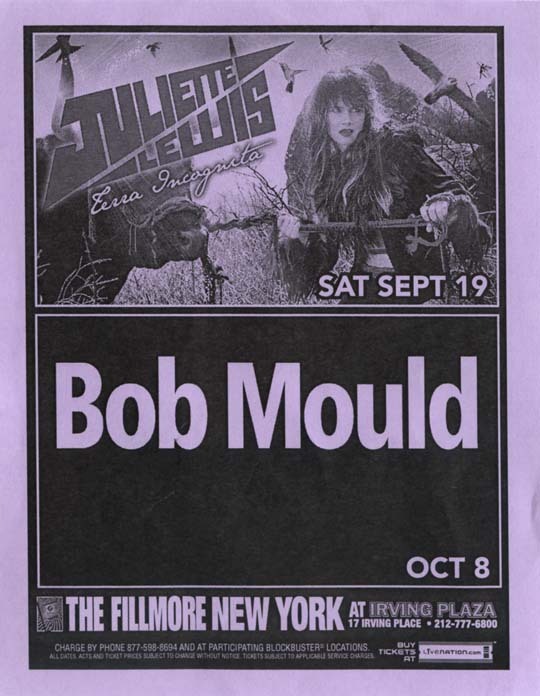 01 Feb 2009 Put up a flyer image for Bob Mould's 11 Oct 1996 show at Birch Hill (Old Bridge NJ) and upgraded the flyer images for his 25-26 Sep 1998 Irving Plaza (NYC) and 12 Oct 2005 Doug Fir (Portland OR) shows. Updated the 1996, 1998 and 2005 flyer index pages. Thanks to Craig Giffen for the Birch Hill and Doug Fir paperware. 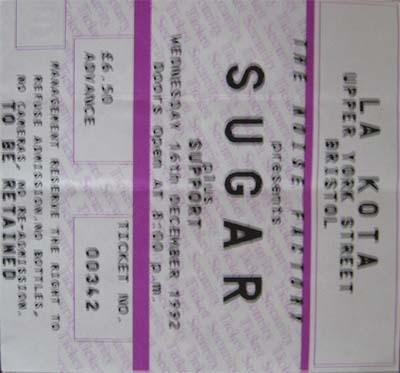 01 Feb 2009 Added images to the ticket collage page for the 16 Dec 1992 Sugar gig at Lakota (Bristol UK) and the 14 Jan 2005 Bob Mould gig at the Paradise (Boston). 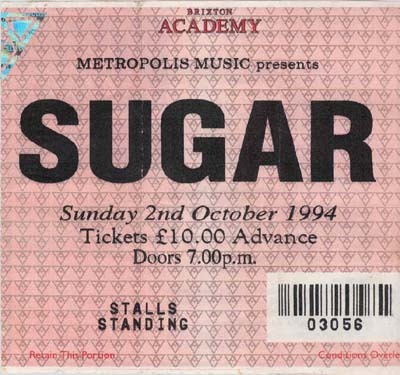 Added the Sugar performance, previously unlisted, to the dates pages (along with a mysteriously missing entry for the Manchester gig the night before), and put up a venue image page for the Lakota. Thanks to Darrell Warren for the Bristol info and ticket image. 30 Jan 2009 Fixed broken links to Mark Weygandt's Bob Mould site on the Hüskerlinks and dates pages. 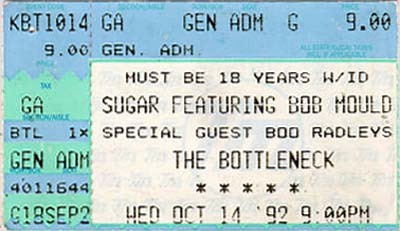 30 Jan 2009 Put up a fairly lengthy, quote-rich piece on Bob Mould and Sugar from the 03 Nov 1994 issue of Rolling Stone and updated the magazine articles page. 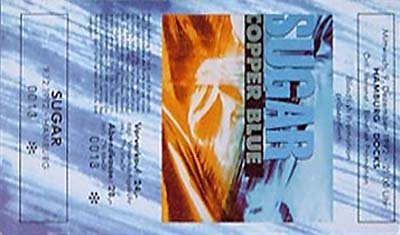 Also clipped a photo from the article of Sugar performing at the 40 Watt in Athens during the Copper Blue warmup tour (10 Jul 1992) and created a performance stills page from it. 30 Jan 2009 Bob Mould Band to play Coachella this spring, on Saturday, 18 April. 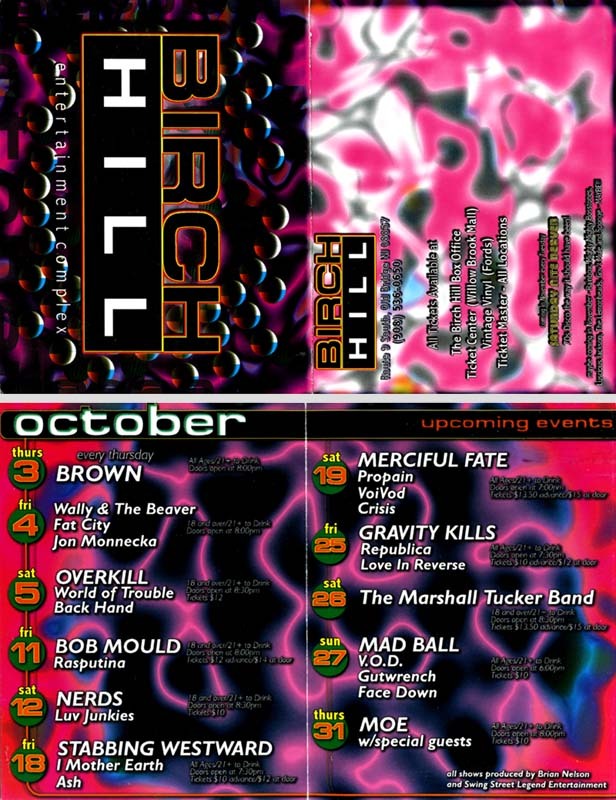 Updated the dates page, put up a venue image and a flyer image, and updated the 2009 flyer index page. Thanks to Terry T. for for passing the info along to the Sugar list. 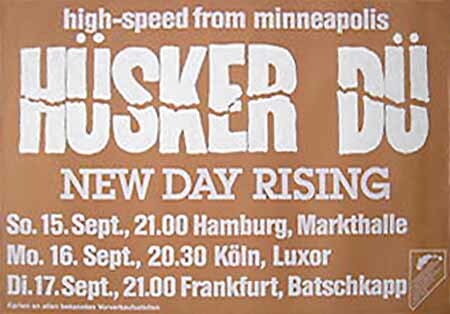 30 Jan 2009 Put up a flyer image for the 15-17 Sep 1985 German Hüsker dates; updated the 1985 flyer index page and dates page. 28 Jan 2009 Added Grant's 09 Feb 2009 Turf Club gig and his 18-19 Mar SXSW gigs (venues TBD) to the dates page. 25 Jan 2009 Added the 2005 split 7" Tolerance. A Tribute To Grant Hart to the Hüsker Dü Covers & Tributes page, put up an artwork page for it, and updated the Hüsker covers cross-reference page. A-side is a cover of "Keep Hanging On" by The Maykings, B-side is a cover of "2541" by Lorrie Matheson & the Brass Tacks. 19 Jan 2009 Added Grant's guest appearance at last Saturday's Suicide Commandos gig at Nick and Eddie Restaurant in Minneapolis to the dates page and put up a venue image page for the restaurant. Grant jumped onstage to sing backing vocals along with guest vocalist David Thomas on "Final Solution." Thanks to James Lindbloom for passing along the info and link to a murky YouTube video. 18 Jan 2009 Put up a page of Hüsker Dü art images, consisting of drawing, paintings, caricatures and other non-photographic pictures culled from various sources, and linked it to the main Hüsker images page. 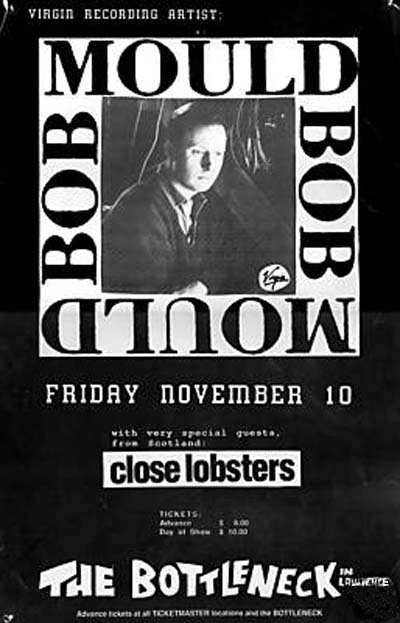 18 Jan 2009 Found a poster at gigposters.com for Bob's 19 Apr 2007 CIMS gig in LA, which pinned down the venue as Riot House, a nickname for the Hollywood Hyatt. Updated the dates page and 2007 flyer index page, and put up a venue image page for the Hollywood Hyatt (now under new management). 16 Jan 2009 Added a short photo feature on Bob Mould from the current issue of Magnet and updated the magazine articles page. Thanks to editor & publisher Eric T. Miller for permission to use the article and for making my life easier by sending the text. The full photospread that includes the shot of Bob  a retrospective feature coinciding with the magazine's 15th anniversary  can be found as a slide show here. Created and linked to venue image pages for The Hotel Cafe, Varsity Theater and Joe's Pub, and updated the dates page. 15 Jan 2009 Bob's upcoming album finally has a title, Life And Times. Updated its annotated discography entry, listed it in the summary discography and put up a preliminary artwork page for it. Created and linked to a venue image page for Gravity Lounge and updated the dates page.  Bottom of the Hill.  Café du Nord/Swedish American Hall.  Great American Music Hall. Also abandoned the link to the Warfield's constantly shifting Citysearch page and replaced it with a link to an onsite venue description page. 09 Jan 2009 Bob Mould was just added to the list of artists performing at Noise Pop 2009 in San Francisco. Added his show, 27 Feb 2009 at the Swedish American Hall (Café du Nord) to the dates page. 09 Jan 2009 Added comments received from Perrin Coman to the venue description page for the Euphoria Tavern in Portland OR. 09 Jan 2009 Fixed a couple of typos on the Live Audio Recordings page: Gaston Hall, site of Bob's 06 Mar 1995 show, is on the campus of Georgetown, not George Washington, University; broken photo link to Bob's 05 Apr 1995 show at 7 Willow Street was removed. Thanks to J. Scott Watson for the heads up. 04 Jan 2009 Added info and comments received from Chris Harrod to the venue description page for The Vatican in Houston. 03 Jan 2009 Added an entry for Joe Carducci's Enter Naomi to the Hüsker Dü Bibliography and added 1985 Naomi Petersen photos of Hüsker Dü and Grant in LA to the Hüsker Dü images page. Thanks to Andy Earles for the book recommendation. 03 Jan 2009 Added Dottie Danger's cover of "Chartered Trips" to the Hüsker Dü Covers & Tributes page, updated the Hüsker covers cross-reference page, and put up an artwork page for the Uyut Ruin CD EP on which the track appears. Thanks to Vladimir Ponomarev for the info and links. 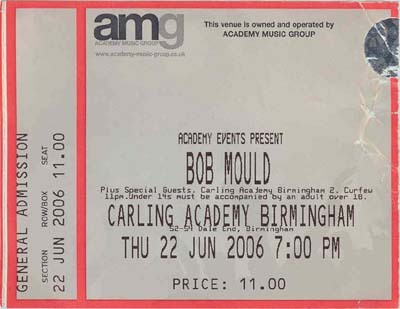 01 Jan 2009 Put together a performance stills page for Bob Mould's 24 May 2008 Academy (Manchester UK) full-band gig and added a dates page link to it. Also added one of the candid after-show shots to the Hüsker Dü images page. Thanks to Ole Krogstad for the images; photos were shot by his friend, Katharina Østensen.